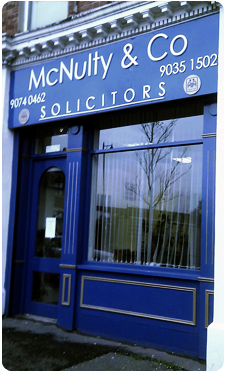 McNulty & Co. (formerly Bogue and McNulty) are based locally in North Belfast at Carlisle Circus, within easy reach. Should you wish to discuss any aspect of a legal enquiry, contact our office to arrange to speak with one of our Solicitors. Our Solicitor, Gordon Laird, has over 25 years of experience dealing with people like you, and he will personally deal with your case. We are happy to discuss matters further without obligation.